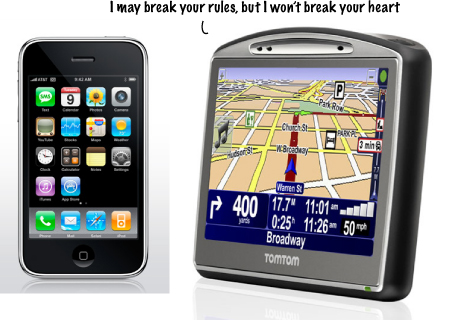 iPhone SDK Agreement - Not So Much With the Real Time GPS? Applications may not be designed or marketed for real time route guidance; automatic or autonomous control of vehicles or aircraft, or other mechanical devices; dispatch or fleet management; or emergency or life-saving purposes. ...While we're (reticently) on board with the requirement that you can't make an app that will drive your car for you, the rest seems pretty egregious. No control of 'mechanical devices?' Sounds like that sweet iPhone-driven Lego Robot is verboten. No 'fleet management?' Sorry UPS, no iPhone for you. The big one, of course, is no 'route guidance.' Pish posh, we say, TomTom said they're coming and we're guessing they weren't lying. We have previously said here we were slightly worried that Apple would be overly-stringent about what apps they would let into the App Store -- here's to hoping that rules like these don't get strictly enforced.